I will admit to having a love affair that started after I met my wife and that endures to the present day. No, the object of this affection is not another woman/man (although I suspect that my wife, like many women, probably envies its figure!). The object is none other than a 4 foot stick, made of Japanese oak. It feels surprisingly light in the hands, is textured with the bumps and bruises of contact over 20-something years, is well-worn at the edges and smells faintly of my sweat, absorbed over countless training sessions. Like any relationship, my affair with the jo has followed a kind of cycle: a mad infatuation with something brand new, sleek and good looking; periods of frustration and hard work; and more recently a period of renewed appreciation - of loyalty, fidelity, deeper understanding and a kind of reverence. A video where I discuss the basic grips and stance relating to the jo. In short, my old jo occupies a sacred place in my heart. Nowadays I reserve it for solo practice and occasional work. I avoid banging it too much; I want it to last the distance. And so, like some Utah polygamist, I recently got myself a "new model" - a jo made of rattan (a kind of bamboo). Slightly thicker, but slightly lighter, it is something I feel I can wield freely in training. It is young and pliable enough to take as many knocks as my training partners can dish out. In my mid-life crisis the "new jo" and I "party hard" - but we don't (as yet) have any real history. Perhaps we never will. It hardly matters. My true mistress waits patiently for my return. So why the sudden interest in a "new model"? The answer is simple. I'm writing a book on the jo, and I'm worried that the preparatory early morning training sessions with my senior student Jeff will be too hard on "the old girl". What is this book about? It is a comprehensive and detailed description of essential jo techniques; techniques that are not only effective and pragmatic (though not easily mastered) but also sublimely elegant. As my teacher Bob Davies put it: "jo is the essence of flow". Through years and years of training I am finally understanding the truism that a weapon is merely the extension of one's hand. I can not only grasp this simple statement on a cognitive (and literal) level; I can understand it intuitively and (I hope) apply its principle. 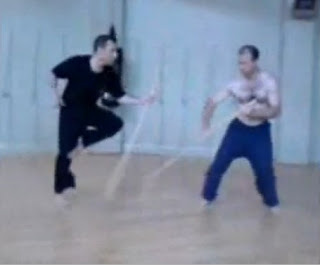 What is so special about the jo is that it combines the best of all worlds in terms of sticks: It is light enough to be wielded with one hand (although this is not where its primary "magic" lies). It can be used like a katana (samurai sword) - yet it can also be flipped and used "end to end". 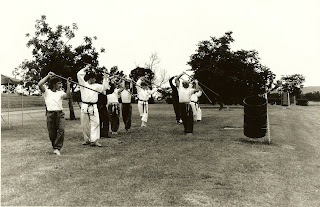 Unlike the bo/kon (longer staff), you can use a grip that is biased to one side. But like the bo/kon, you can also grip it in the middle (if circumstances require it). In short, it is a weapon for all occasions. And like any stick, it amplifies your movements. This is both a blessing and a curse. When you stuff up, it is apparent for all to see. In sparring you know when you've miscalculated. You just know you're going to cop it and there is no escape. On the other hand when you get things right, you look bloody marvelous. Such is the nature of the jo. There are no "in betweens". It is a hard mistress, but a generous one as well. So in the coming posts, I'd like to start introducing you to some of the basic principles of this magnificent weapon - and show you why it is so special to me. Will do Narda! I will immodestly say: "It's gonna be great!" I've every intention of making it the best jo book there is. Right on, I'm excited to read it. Any other books in the works? Thanks Jonathan. I've got a book tenatively titled "Understanding Karate" in the works (it's substantially written, it just needs editing). Jeff, I'm thinking of naming my new jo "Angelina Jo-lie". And if any of you spot any double entendre's in this article remember: they can mean only one thing. Good luck with the books - really look forward to reading them! SWEET! I want to learn the Jo! I've been looking for a jo book. When does this one come out? Probably early next year Josh. 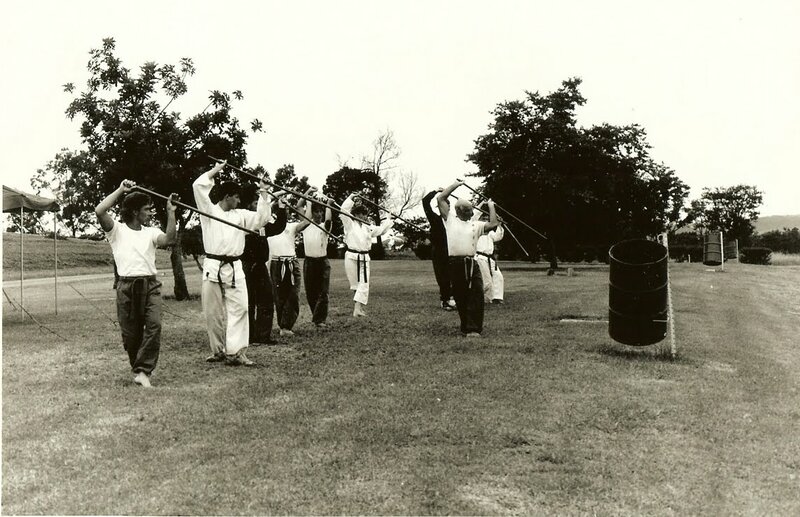 It will be geared for teaching - I'll include very detailed instructions, and a comprehensive set of techniques and 2 person combat drills.